The Passport Sleeves collection comes as a two-pack and each sleeve in the pack is a different design. 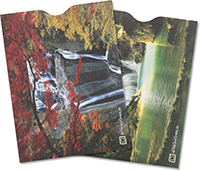 This pack contains our Waterfall designs. Each sleeve fits an ISO7810 ID-3 size passport (Includes US, UK, Australia and others). Designed to protect a single passport embedded with a wireless chip, they protect you against identity theft, tracking and other unauthorized reads. They are made in U.S.A. of high quality advanced paper material, and are puncture-resistant, tear-resistant, weather-resistant and water-resistant (within reason). All of our products are developed in partnership with Identity Stronghold LLC USA, who are the original inventors of this RFID shielding technology.